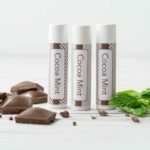 DIY Cocoa Mint lip balm that’s so easy to make and very moisturizing. Its made with essential oils and makes a great gift. Place beeswax, coco butter and jojoba oil in a glass pourable measuring cup. Place container in a pot of water to act as a double boiler. Bring water to a simmer and stir ingredients until fully melted. Remove from heat and add essential oils. Pour into lip balm tubes and put in the refrigerator or freezer until fully set (about an hour or so). Trim off any excess and place cap on. Remove label from backing and attach to your lip balm tube.